Gamer friends, meet the Steam Controller. We’ve heard all about the SteamOS, a Linux-based, gaming-focused operating system that intentionally skirts around Windows. And we’ve gotten our first sense of the living room hardware it will load onto with Valve’s Steam Machines. Now we’ve got the Steam Controller, and since first impressions say a lot, here’s ours: man that thing looks weird. Although it’s roughly the same shape as an Xbox 360 gamepad, the Steam Controller is fitted with a pair of clickable trackpads where you’d normally find twin thumbsticks. The four face buttons are split into pairs, with each set positioned along the inward edge of the two trackpads. Sitting between the buttons in the center of the controller is a high-resolution touchscreen that also doubles as a large, clickable button. Finally, to round things out, there are also four shoulder buttons, two per side; plus two more buttons, one per side, on the back of the controller. Valve notes that the Steam Controller will support all games on Steam, “past, present, and future.” This even includes titles that weren’t designed with gamepad support. “We’ve fooled those older games into thinking they’re being played with a keyboard and mouse, but we’ve designed a gamepad that’s nothing like either one of those devices,” the announcement page notes. It appears that many of the more complicated commands that a keyboard/mouse-only game might demand will be handled on the Steam Controller’s touch screen. The fact that the entire screen is a single, clickable button means that you can use the screen’s touch capabilities to browse through the list of possible commands but not actually input the desired command until you button-click the screen. What’s more, whenever you use the touchpad, its contents are overlaid on your TV screen so you don’t have to look down at the controller. There’s also haptic technology fitted into the device, a feature that is best described as “next-gen rumble.” The dual trackpads are attached to weighted electro-magnets that “are capable of delivering a wide range of force and vibration, allowing precise control over frequency, amplitude, and direction of movement.” The Xbox One’s controller employs similar technology in its two analog triggers. 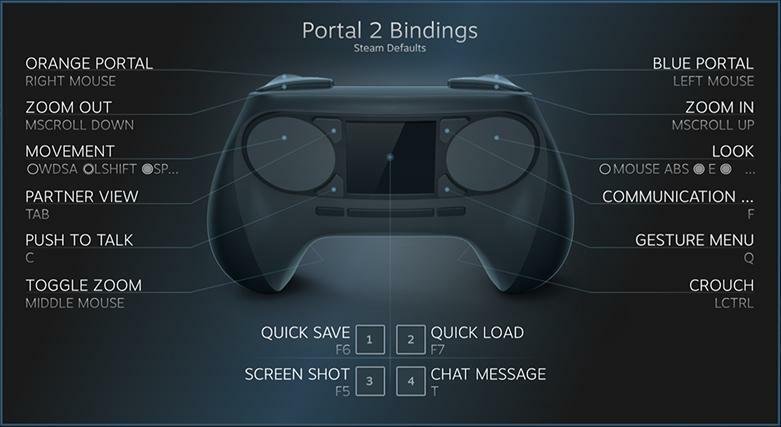 Like the rest of Valve’s reveals over the past five days, continued development of the Steam Controller will be guided by input from the community. The newly revealed device is covered in the same beta that will see a limited number of participants testing out Steam Machines in the near future. The beta version of the controller will be wired and won’t sport a touchscreen – four buttons will be used in its place – but the consumer release in 2014 will more closely resemble the device picture above.